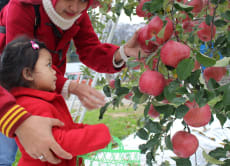 We have an apple farm located near JR Iiyama Station in Nagano. Our English-speaking staff is available for the customers from all over the world. Stenciled apples with original logo are on sale at the shop. Come and taste sweet apples as much as you want!